I am not the most fortunate guy ever when it comes to observations in the sky. I have never seen a shooting star in my entire life, hard as I may have tried. And the Winter solstice lunar eclipse last December, no luck. Clouds obscured the vista that very night, here in Mallorca. Last night, there was to be the longest lunar eclipse in more than a decade, and here in the Western Mediterranean, the view was said to be fine and clear. The weather forecast was better than good. You may have seen yesterday’s total lunar eclipse in all its glory. I did not. I was all set and eager, camera on the ready. But no. It did not happen for me. I went to a Full Moon Meditation Circle with my wife and some friends. We, all 19 of us, had a very good experience, sharing gratitude and affinity, closeness and avidity but no, we did not see the moon. We met at 19h30 in bright sunshine and saw the sun set behind the hills in the West about an hour later. By that time we had already started our full moon ceremony. The moon must have come up by 21h00. 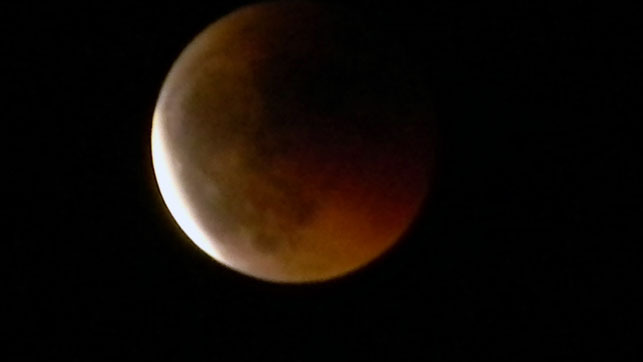 The lunar eclipse must have been starting at around 21h15, reaching a total eclipse of the moon by 22h15. Our ceremony finished at about 22h30. We never saw the moon until after we had said our good-byes and left. There, on the way out and to our cars, we saw the moon (photo top) just beginning to come out of its total eclipse and still a beaut to behold in all its blood orange shade of pale. There you go. I had a great evening in pleasant company, partaking in a very gratifying ceremony. I missed out on another lunar eclipse. There will be a lunar eclipse in December 2011 but, that will be happening before the moon rises here in Mallorca. The next central total lunar eclipse visible here will be on July 27th, 2018. I’ll just have to wait. Patience is the secret. The photo was taken near Felanitx, Mallorca, Baleares, Spain. The date: June 15th, 2011. The time was 23:03:28. I also saw this moon last night. Great capture i wish i would have had my camera on me to get too.